The EU should integrate political and technical advice for Common Security and Defence Policy (CSDP) missions and avoid ad hoc programmes disconnected from larger institutional strategies. The EU should do more to press the governments of Niger and Mali to pursue substantive security sector reform and develop long-term national security strategies. EU strategies and programmes in the Sahel should emphasise good governance, especially access to justice. If CSDP missions fail to follow this approach, they are likely to have only a limited impact on the ground. Stretching from Senegal to Chad, the European Union’s growing presence in the Sahel runs through a security environment that the upheaval of recent years has dramatically reshaped. The EU is intensifying its efforts in the region in response to a succession of destabilising events, from the 2012 Tuareg rebellion in northern Mali and subsequent jihadist occupation of the area to the migration crisis that swept Europe from 2015 onwards (although European concern about the region has been increasing since 2008, if not earlier). It is in the Sahel that some EU members believe they must fight a key battle for the future of the European project, viewing the stabilisation of the region – particularly through initiatives to curb migration and counter terrorist threats – as key to heading off populist nationalism at home. Yet while its efforts to stabilise the Sahel have had some limited successes, the EU’s attempts to integrate security and development initiatives there may prove costly, unsustainable, and incomplete in the long term. This is partly because the organisation depends on the cooperation of local governments – which are well adapted to the evolving geopolitics of, and international attention on, the region – and partly because EU institutions are often unable to sufficiently monitor the programmes they establish. Moreover, in their drive to respond to political pressure from member states, EU interventions in the region sometimes fail to adapt to conditions on the ground, exacerbating local tensions and potentially contributing to instability in the long run. These interventions also risk creating overly large, untenable bureaucracies. In a sign of its growing presence in the Sahel and potential overreach there, the EU is planning to establish a fourth – and, possibly, a fifth – Common Security and Defence Policy (CSDP) mission in the region in the coming years. Another key weakness of the EU’s work in the Sahel is the mismatch between programmes that have a relatively narrow, technical, or short-term focus and its long-standing ambition to implement an integrated security and development strategy. A lack of coordination between programmes, along with other administrative problems, compounds the challenges of operating within severe security constraints – as does a frequent disconnect between technical capacity and expertise on local politics. The EU could address these issues by improving communication and coordination between its staff in the Sahel and officials in Brussels, as well as by focusing some initiatives on good governance, particularly the provision of justice. Yet it remains to be seen whether the EU has the capacity and infrastructure to do so. This policy brief assesses EU programmes in the Sahel and aspects of the G5 Sahel, focusing on CSDP missions and other security-related initiatives in Mali and Niger. It is particularly important to re-examine the merits and evolution of these programmes, and the EU’s pursuit of an integrated regional approach, in the current environment, given Malian President Ibrahim Boubacar Keita’s recent re-election – and the departure of two long-serving EU chiefs of mission in Niger and Mali, as well as several other senior EU officials. As part of its work in western and central Sahel, the EU provides emergency aid to millions of people threatened by food insecurity; capacity building operations to the Malian and Nigerien security forces, under the auspices of the CSDP and the Alliance for the Sahel; direct budgetary support and other security and development assistance to curb migration through Niger and other countries; and increasing political and financial support to the G5 Sahel Joint Force’s operations. 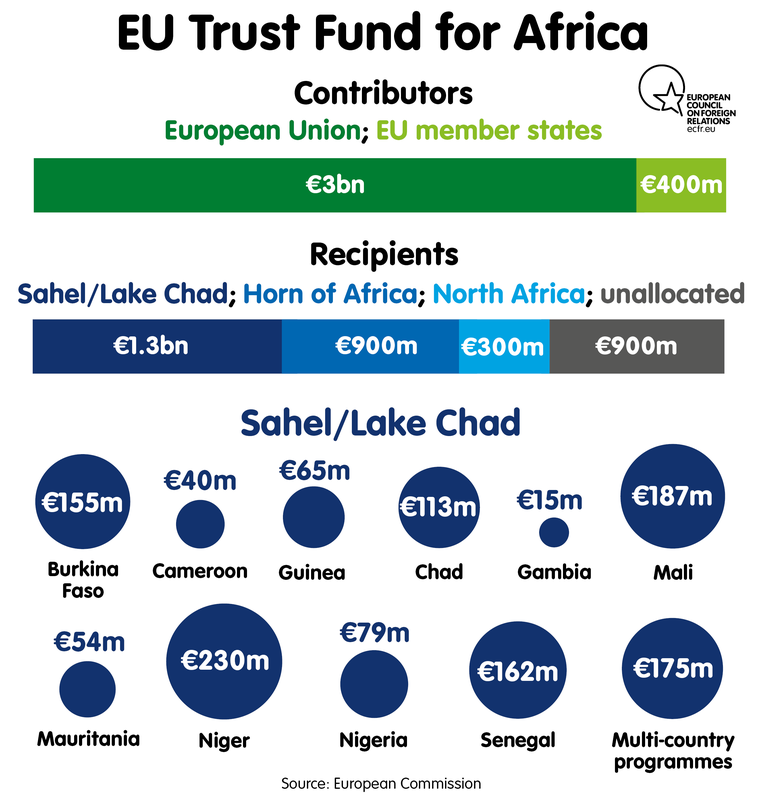 Between 2014 and 2020, the EU and its member states will spend a projected €8 billion on development assistance in the Sahel and the Chad Basin, along with billions more on security, capacity building, and other programmes. 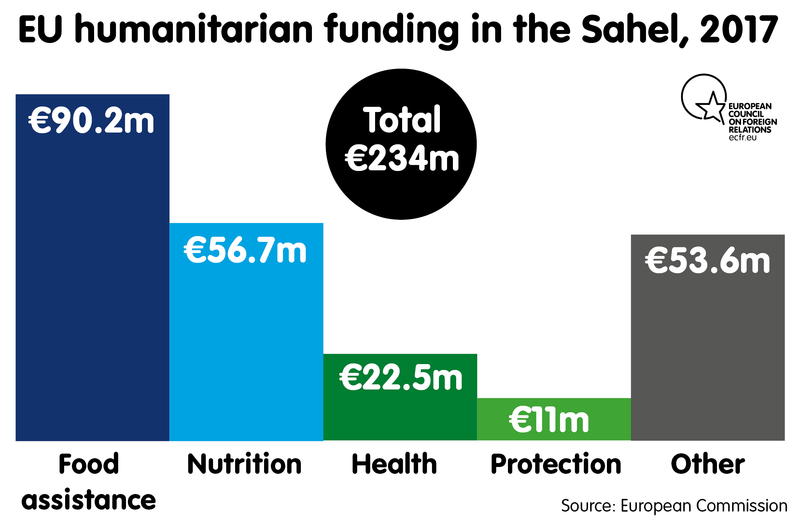 As its officials like to say with some pride, the EU had its eye on the Sahel before the crises of 2013. The organisation developed its first Sahel Strategy in 2011, laying out a vision of security explicitly linked to development. The EU’s 2015 Sahel Regional Action Plan maintains this approach, reiterating the importance of the four original pillars of EU activity in the region: preventing and countering radicalisation; improving economic and social conditions for young people; managing migration, mobility, and border issues; and fighting illicit trafficking and organised crime. The plan frames this activity around the nexus between security, development, and governance. Meanwhile, the EU attempts to coordinate the various regional and international actors that have launched security and development programmes in the Sahel in recent years. Ever since it elaborated an initial Sahel strategy, the EU has made the region a top priority. This is due not just to the recent series of crises there but also the EU’s prevailing view of the region as a kind of laboratory for its foreign policy, aid, and capacity building programmes. Indeed, some EU officials describe the array of programmes in the Sahel as test cases for an integrated approach to security and development, as well as for new forms of capacity building within CSDP missions. In this, the EU faces several challenges – and not just in managing its own programmes. The EU must also contend with member states’ competing interests and overlapping missions and contributions, which range from the trans-Sahelian, French-led Operation Barkhane to the recent deployment of Italian soldiers to Niger to fight human smuggling. Some of the EU’s first major responses to crises in the Sahel came in the form of CSDP missions. There are currently ten civilian and six military CSDP missions worldwide, including military missions in Mali, Somalia, and the Central African Republic. Created in 2012, the EU Capacity and Assistance Programme (EUCAP) Sahel Niger initially focused on integrating Niger’s internal security forces, as well as improving the country’s capacity to fight terrorism and organised crime, its human resources and personnel management, and regional coordination on counter-terrorism and organised crime. The mission has had mixed results. EUCAP Sahel Niger initially had to contend with a shortage of resources and plans ill-suited to conditions in the country. For instance, in 2013, Nigerien soldiers in Agadez who lacked petrol for their vehicles began to siphon fuel from generators the EU provided under the mission (to power computers that they and local gendarmes could use to access crime databases). However, Niger’s government has since recognised EUCAP Sahel Niger’s value and gradually adapted, increasing access to, and participation in, the mission. This shift in attitude could be seen following the onset of the European migration crisis, particularly after the November 2015 Valletta Summit on Migration. Six months earlier, the EU had expanded the mission’s mandate to include the fight against clandestine or illegal migration – a problematic concept given the long history of migration as a way of life in the Sahel and the Sahara, as well as contemporary agreements guaranteeing freedom of movement for citizens of the 15 countries in the Economic Community of West African States. By July 2016, EUCAP Sahel Niger had received an updated mandate and permission to establish a permanent contingent in Agadez, which would build Niger’s capacity to prevent migration. The EU also accelerated its work with the International Organization for Migration, providing significant support to the body’s efforts to document the movement of, and provide assistance to, migrants. 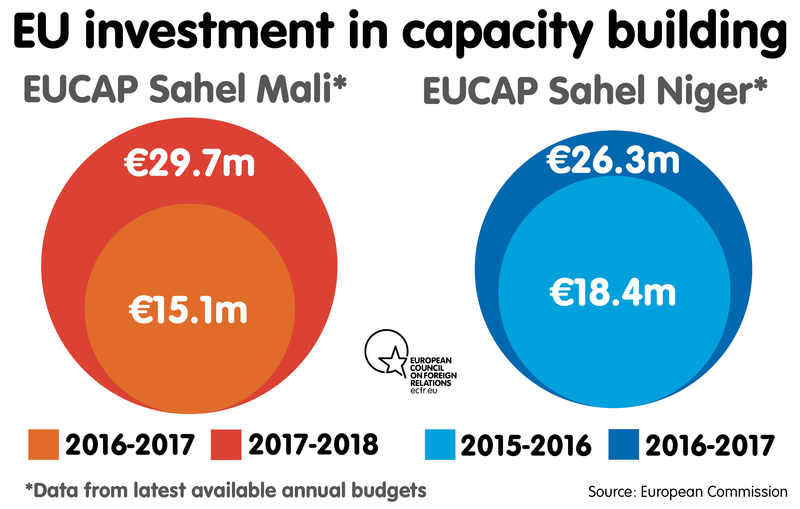 Accordingly, EUCAP Sahel Niger’s budget has grown from €18.4m to €26.3m since it began; it now employs 169 staff, most of them in Niamey. These changes in EUCAP Sahel Niger conformed with the EU’s broader response to the migration crisis: an increasing emphasis on securitisation and capacity building as a quick fix for the large-scale political and socio-economic issues that help drive the movement of people through the region and towards Europe. (The approach predates the crisis, but became more prevalent after 2014.) In Niger after 2015, the response took the form of a security crackdown that led to the arrest of hundreds of alleged people traffickers and the confiscation of their vehicles; increased security patrols; and aggressive tactics to block well-trodden migration routes into Libya and, to a lesser extent, Algeria. In Niger, the EU has also been short-sighted in its failure to support local populations who depended on migration for their livelihoods. It has provided only a small percentage of the funding and assistance it promised to these people, creating enormous frustration among locals. By helping criminalise migration across the Sahel more broadly, the EU has contributed to a security apparatus that will likely remain in place for as long as the issue remains a political hot button. Yet this securitisation process stymies regional labour movement, encourages countries such as Algeria to take an even harder line on migrants without fear of repercussions, and forces migrants to take increasingly dangerous routes. It also helps fuel popular anger against the growing foreign security presence in Niger, threatening the future of EU programmes there. The resulting disruption can help foster local conflict, as a lack of alternative employment opportunities can push people, particularly young men, to use their driving and navigational skills for illicit trafficking or armed violence. These delicate local dynamics are becoming increasingly difficult to balance with the growing number of international actors operating in the Sahel – sometimes in cooperation with one another, and sometimes independently (in pursuit of their own geopolitical and domestic interests). One example of this is the deployment of Italian soldiers to Niger announced in September 2018, eight months after the Italian parliament approved the mission. In early 2018, reports that Italy would deploy soldiers to Niger prompted Tubu military commanders to race for outside assistance from France and other partners, fearing that their rivals would otherwise gain an advantage in foreign backing to curb migration. The previous autumn, there were reports that Tubu military leader Barka Chidimi – long active in the border regions of Chad, Niger, and Libya – had sought direct payment from the EU to “secure” Niger’s border with Libya. Allegedly, Nigerien defence officials later claimed that Chidimi received payment from France for this purpose. If payments of this kind do occur, the EU’s security and migration policies could pour huge amounts of money into the region even as member states’ policies undermine or complicate its efforts. The EU’s migration policies have also made it more difficult to exert pressure for governance changes on governments in Niger, Mali, and other Sahelian countries, which realise that Europeans need their cooperation to tackle migration and counter-terrorism challenges. Niger’s president, Mahamadou Issoufou, has been particularly adept at using discourses on terrorism and migration to cement his position as an essential partner. For example, he stressed his government’s importance to EU leaders at the February 2018 meeting of the G5 Sahel Joint Force in Brussels, stating, “the Sahel is a dam that must not break.” Reminders of this kind have helped earn Niger visits from EU High Representative Federica Mogherini in 2015, 2017, and 2018; German Chancellor Angela Merkel in 2016; and various French officials in recent years. As such, the EU remains attentive to a Nigerien government that has repeatedly harassed the domestic opposition even as the foreign presence in Niger expands. Mali’s president, Keita, has used similar language to garner international support, commenting in late 2017, “Mali is a dam. If she bursts, Europe will be submerged.” Like Issoufou, he is keenly aware of the importance the EU and its member states place on Mali and regional security in general. For instance, EUCAP Sahel Mali employs 194 people (including local staff). Although it has no mandate on migration, EUCAP Sahel Mali’s responsibilities include training internal security forces on everything from operational management and human resources to professional ethics, maintaining public order, training judicial police, intelligence gathering, and counter-terrorism. The mission is also tasked with helping implement the government’s security sector reform (SSR) plans, which – like some other EU programmes that deal with security, governance, and development in Mali – focus on re-establishing a state presence in the country’s north. Like EUCAP Sahel Niger, the Mali mission provides direct strategic advice to the internal security ministry. In its launch of EUCAP Sahel Mali in January 2015, the European External Action Service (EEAS) sought to avoid the missteps it had made in Niger. This involved granting the new mission a formal legal status from the start and improving the pre-deployment training of its staff. However, a recent European Court of Auditors report found that, like the Niger mission, EUCAP Sahel Mali encountered difficulties in staffing and recruitment that interfered with its (admittedly expansive) mandate. The audit also stated that, while both missions’ training operations produced some satisfactory results – especially in training Nigerien security forces to counter terrorism and organised crime – these results were likely unsustainable. And it found that the missions had little success in improving internal coordination among security services, or in adopting broad-based security doctrines. The missions also have several larger problems. Although host governments have asked the EU for more strategic advice, the missions remain largely focused on technical capacity building, and their staff in the field are ill-equipped to address overarching political challenges that affect security reform and operations. Additionally, the missions heavily depend on host governments’ management of domestic security forces (which is very uneven), as well as their willingness to cooperate and pursue reform during a conflict and its aftermath. In short, EUCAP Sahel missions often fail to adopt the integrated approach the EU advocates. Members of EU and UN missions in Mali, as well as senior EEAS officials responsible for West Africa, have indicated that they rarely coordinate, or even engage, with the EUCAP mission in the country. This creates a gap between the overarching goals of EU programmes, which centre on political concerns as much as pure technical capacity to enforce security, and the fragile security environment in the Sahel – thereby reducing the effectiveness of these programmes. Created in February 2013, the European Union Training Mission (EUTM) in Mali works to reconstitute a Malian military buffeted by the Tuareg rebellion, the jihadist occupation of the north, and the country’s March 2012 military coup. The mission typifies both the tentative gains and significant limitations of EU programmes in the Sahel. Having initially provided basic infantry and other training, the mission has evolved to adopt a “train the trainer” model designed to improve the country’s armed forces in a more sustainable manner. Alongside their involvement in capacity building and the formation of eight groupements tactiques interarmés – each of which comprises 800 soldiers and other personnel – the EUTM and EUCAP Sahel Mali have provided extensive advice on the legal underpinning of Mali’s military reforms. Malian soldiers who have undergone EUTM training are generally positive about its outcome. And several recent security operations – such as Operation Dambe, conducted in central Mali in early 2017 – suggest that these soldiers have acquired greater tactical awareness, as well as a capacity to hold position during an attack and to carry out some offensive missions. However, these improvements have had only a marginal effect on the overall security situation. The security environment in central and northern Mali continues to deteriorate: in its June 2018 report on the country, the United Nations recorded an almost 200 percent increase in attacks there in the preceding year. Clearly, neither the Malian armed forces nor the UN Multidimensional Integrated Stabilisation Mission in Mali has been able to prevent a rise in violence (although it would be unfair to expect such an outcome from these institutions and programmes alone). Senior EU officials acknowledge the EUTM’s limited effectiveness and the fact that around 400 of its 600 personnel focus on force protection, with one stating, “no one can say it works well”. This is not to dismiss the real threat the EU faces: EUTM personnel reacted quickly and effectively to attacks on their headquarters in Bamako in March 2016 and on a hotel known as Le Campement in June 2017. These responses saved lives and deserve recognition. But the point remains that a variety of internal and external factors reduce the EUTM’s broader effectiveness. Like the EUCAP Sahel missions, the EUTM is based on a model of capacity building the EU developed in countries such as Somalia and the Central African Republic. Although EUCAP Sahel and, to a lesser extent, the EUTM work on some aspects of structural reform, Mali has yet to undertake comprehensive SSR. Host governments’ approach to working with the EU and foreign partners also hampers EU programmes. For instance, despite warnings from Malian analysts, the government in Bamako was exceptionally slow to react to the growing insurgency in central Mali, thereby restricting its policy options. The government has resisted thoroughgoing SSR due to a variety of factors, including its preference for technical assistance that leaves underlying structures and personnel in place; its resistance to addressing patronage networks embedded in military recruitment systems; and, possibly, its desire to limit the strength of the army command, in light of the 2012 military coup. Mali and Niger integrate former rebels into their security forces, and manage ongoing crises, in different ways. Political scientists Yvan Guichaoua and Mathieu Pellerin describe Mali’s approach as “peacemaking” and Niger’s as “peacebuilding”. This distinction reflects Niger’s more flexible and sustainable approach to maintaining stability through the integration of key actors into state structures as security and governmental mediators and advisers. This system is fragile, as it often depends on goodwill towards, and government tolerance of or cooperation with, political actors who are current or former rebels or traffickers. In contrast, Malian governments have long set rival communities against one another – a dynamic that can be seen in the country’s central regions and, to some extent, the Mali-Niger border region. The approach of choosing sides and relying on local militias is especially problematic in Mali because the government is hesitant to pursue comprehensive SSR. It is also problematic because the government drags its feet on implementing key provisions of the Agreement for Peace and Reconciliation signed in Algiers in 2015, such as those on creating a territorial police force and implementing the Operational Coordination Mechanism (designed to integrate armed groups into local and regional security structures). The government is not solely culpable for the slow implementation of these initiatives. But, as the government has overall responsibility for SSR, its inaction provides armed groups with an excuse to avoid fulfilling their own responsibilities. With each member of the EUTM setting the rules of engagement and force protection for its own contingent, the mission cannot deploy troops to accompany trainees and reinforce the lessons they have learned. This limitation adds to the challenges the EUTM faces in dealing with the language barrier between some of its troops and in recruiting qualified personnel. 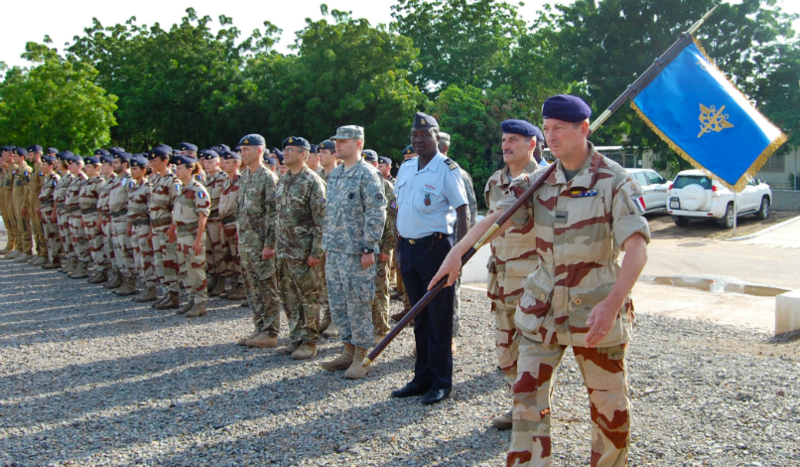 As with the EUCAP Sahel missions, the EUTM appears to suffer from a chronic absence of evaluation and monitoring. This shortfall can make it difficult to measure the impact of the mission, and to identify how its training and capacity building efforts should evolve. Nonetheless, the EUTM has clearly failed to prevent Malian troops from engaging in human rights violations – which continue to drive recruitment to jihadist groups – or to improve their capabilities to the extent that they can effectively coordinate with partner forces. These deficiencies stem from the fact that the EUTM focused on questions of technical support and capacity building rather than real reform, governance, and strategic planning. Although the Malian government has worked with the EU and other foreign partners on SSR planning since before the 2012 rebellion, it has never implemented serious reforms (for many of the reasons discussed above). Any training the EU conducts will have little impact unless there is a fundamental change in not just local security forces’ organisation and training but also their operational methods, including their recruitment process and their deployment practices. Without genuine, far-reaching reform, the shortcomings of Mali’s armed forces will undermine security in the country, as well as the potential effectiveness of the G5 Sahel Joint Force and the stability of border regions. Brussels has taken steps to improve coordination between EU institutions, as well as between the EU and G5 Sahel countries. It has done so partially through the regionalisation process EU officials describe as key to their strategy, whereby CSDP missions and other EU programmes spread out across the region and increase their coordination within the EU and with the G5 Sahel in particular. The EU’s emphasis on regionalisation – a trend the United Nations, along with Operation Barkhane, also embraces – is a response to concerns about CSDP missions’ duplication of effort and other failures to coordinate their activities with one another. To address these concerns, the EU created a CSDP security network in the Sahel under the first phase of its regionalisation plan, which the European Council adopted in June 2017. It also established a regional coordination cell (RCC) within EUCAP Sahel Mali. The RCC consists of seven experts located in the mission’s headquarters in Bamako and another seven attached to EU delegations in G5 Sahel countries. The cell works to identify and fill gaps in cross-border cooperation in the region. It also helps organise training courses for G5 Sahel countries and further develops the EU’s regionalisation plan. The next phase of the regionalisation process could take multiple forms. While some in the EU had proposed that the EUCAP missions be extended to all G5 Sahel countries, G5 Sahel officers are already able to conduct training in Mali or Niger if the countries invite them to do so. Instead, EU officials and others close to the planning process say the next step will be the creation of a fourth CSDP mission in the region – likely a civilian one. Headquartered in Nouakchott, the new mission will work to improve coordination between the EU and the G5 Sahel. The EU will reportedly open another CSDP mission or a smaller coordination and training bureau in Burkina Faso. 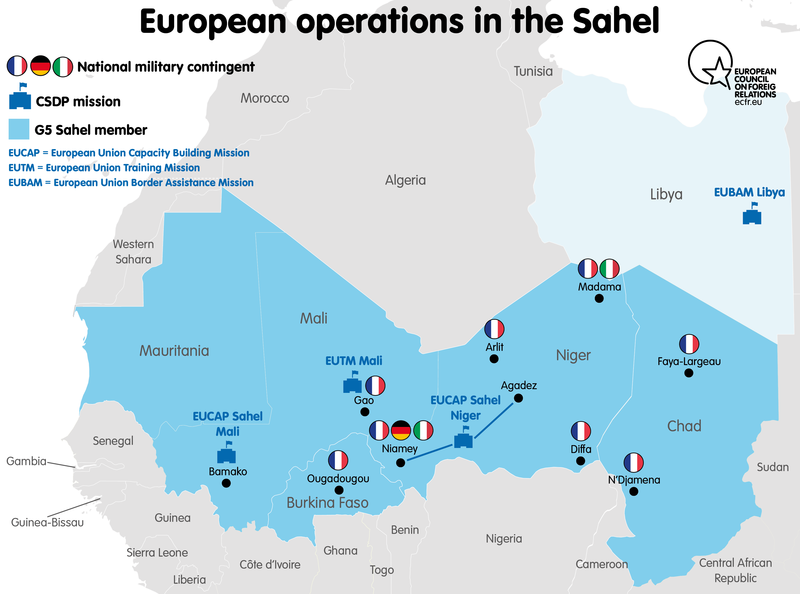 This regionalisation of CSDP missions mirrors the regionalisation of the Sahel’s security architecture – not least through the rapid operationalisation of the G5 Sahel Joint Force, an effort the EU has energetically supported. Yet it also demonstrates the EU’s tendency to create ad hoc solutions to strategic problems, and to pile coordination structures on top of one another while progressively burdening CSDP missions with responsibilities they are ill-equipped to handle. As several EU interlocutors have observed, extending EUCAP Sahel mandates to cover counter-terrorism – as has been done in both Mali and Niger – might please leaders in Brussels but it is beyond the missions’ capabilities. Staffing CSDP missions has proved difficult even without these additional responsibilities, due to a shortfall in qualified staff and security officials who speak fluent French. The official language of government in the region, French is especially important because most foreign contractors, employees, and diplomats do not speak local languages. A good example of this tendency toward ad hoc solutions is the Groupes d’Action Rapides – Surveillance et Intervention au Sahel (GAR-SI). Instead of forming part of a CSDP mission, the GAR-SI draws €41.6m from the EU Emergency Trust Fund to create mobile intervention groups across G5 countries. It also provides training for similar groups in Senegal at the Spanish special forces training facility in Logroño. These intervention units, which can play an important role in improving security and border cooperation, have had some success in directing efforts to train other response and intervention units in Mali, such as the Forces Spéciales Anti-terroristes et de Sécurité. And, while the GAR-SI may have improved countries’ (especially Mauritania’s) security and response capacity, it has not been integrated into regional security programmes. Moreover, GAR-SI’s management and organisation have caused tensions within the EU. For instance, Spain may have been unhappy because it perceived GAR-SI as having been largely ignored in favour of French- and German-led programmes. Whatever the truth may be, such tensions demonstrate the degree to which security programmes in the Sahel remain fragmented and poorly coordinated, as well as the way in which rivalries between EU member states can derail attempts to accurately evaluate these programmes. Finally, while the EU’s regionalisation drive may help improve coordination between security and development initiatives across the Sahel, its fate will largely depend on reform in G5 Sahel countries’ security and governance sectors. The deterioration of the security environment in the Liptako-Gourma region (where Mali, Burkina Faso, and Niger meet) will increasingly strain coordination efforts and other development initiatives. If troops from the G5 Sahel Joint Force commit atrocities – such as when Malian soldiers attached to the force reportedly killed a dozen civilians in the border town of Boulikessi in May 2018 – this will call into question not just the efforts of the grouping but also those of the CSDP missions working to improve training and prevent human-rights abuses. The EU’s integrated strategy for the Sahel centres on the idea that security, development, and governance are inherently intertwined. Perhaps due to EU nudging, this concept has also become a focal point for the G5 Sahel – so much so that the organisation’s crest bears the words “security and development”. Yet after 2015, amid a worsening security crisis in central Mali and areas near the country’s borders with Niger and Burkina Faso, it became increasingly clear that a failure of governance was a core driver of the violence. A lack of political representation and access to justice seemed to be particularly important causes of conflict. For the EU and other foreign powers, attempts to address governance challenges are therefore crucial to peace and stability. This recognition of governance reform’s importance to stabilisation – rather than just to economic development – has led the EU to a rethink its missions in the Sahel, but this process of reformulation is in its infancy. Governance problems in the region often include a lack of access to state representatives; basic public services; a free and impartial judiciary; protection from the predatory behaviour of local officials (a leading concern in places such as central Mali); and the national resources that allow for true political decentralisation. The Stabilisation Action in Mopti and Segou, which the European Commission approved in August 2017, has sought to address these challenges. It is designed to help Mali implement its Plan de Sécurisation Integré des Régions du Centre (PSIRC), an initiative focused on integrating security, economic, and governance reform in the country. The PSIRC also draws on support from EUCAP Sahel Mali and the Programme d’Appui au Renforcement de la Sécurité dans les Régions de Mopti et Gao et à la Gestion des Zones Frontalières (PARSEC). The latter is another programme designed to integrate security and development initiatives, with a specific focus on Mali’s Mopti and Gao regions, under the EU Trust Fund for Africa. Costing €29m and €3.25m respectively, PARSEC and the Stabilisation Action are hardly the priciest or most important programmes in the region, when measured against the EU’s expenditure of billions on development aid and hundreds of millions on direct budgetary support to regional governments. Nonetheless, these initiatives hint at the trajectory of EU policy in the Sahel. Indeed, some EEAS officials describe the Stabilisation Action as “a great tool to operationalise the [EU’s] integrated approach” in the region. And European officials responsible for stabilisation operations portray it as responsible for three of the four pillars of the PSIRC that are not directly related to security (EUCAP Sahel Mali covers the security aspects of the initiative). The PSIRC’s declared mission is to work through “secured poles of development and governance” in 12 troubled areas in the Mopti and Segou regions. On the surface, the plan includes several positive, innovative ideas for securing troubled areas. It is based on eight “strategic axes”: re-establishing effective public administration; protecting civilians in unstable areas; providing for the free circulation of goods and people within conflict-affected areas; analysing and addressing insecurity; acting locally but with international coordination; curbing the proliferation of small arms; countering illicit drug trafficking and organised crime; and coordinating, monitoring, and evaluating the government’s strategy for addressing insecurity and terrorism. The plan envisions an initial six-month emergency response, as well as attempts to gain the support of local populations, compensate for the absence of the state in some areas, and create a sustainable security infrastructure. The plan is remarkably frank in its recognition of communal vulnerabilities and the state’s failure to govern effectively, pursue socio-economic development, promote political dialogue, or manage local affairs – not least in disputes between traditional leaders and state institutions. However, the plan remains largely focused on security operations and economic development to stabilise Mali and prevent jihadist recruitment in the country. Although the plan discusses infrastructural requirements and security planning in great detail, it has little to say on establishing governance structures that could restore stability. Security improvements are necessary to reinstate government officials, and spur investment, in central Mali, but governance planning so focused on the short term is still disconcerting. Even more problematically, the word “justice” appears only three times in the 46-page document (by comparison, the word “security” appears 98 times). This speaks to a failure to understand not just the drivers of violence and radicalisation in central and northern Mali, but also the importance of improving the state’s behaviour rather than merely reasserting its authority. Governments’ inability to provide impartial judicial services, equal access to justice, and physical security has been a key driver of conflict in the Sahel for decades, but the problem has grown worse since 2012. As a consequence, jihadists’ administration of justice – however rudimentary and brutal – played a major role in their expansion in northern Mali in 2012 and central Mali, as well as parts of the north, after 2014. During and after the 2012 occupation, numerous Malians who had lived through this period spoke of the security and even improvement in commerce jihadist forces sometimes brought about, particularly when compared to the National Movement for the Liberation of the Azawad’s alleged thievery and human-rights abuses. As Malian and international observers have noted, jihadist groups also empowered Islamic judges, or cadis; according to some reports, some locals in rural Mopti seek out these judges rather than their state counterparts. However, the PSIRC’s shortcomings may be less important than the problems with its implementation. And, despite the plan’s relatively detailed vision of the nexus between security, development, and governance, these problems have ramifications for EU policies meant to support the PSIRC. A series of PSIRC clearing operations designed to improve security and restore the state’s presence in central and northern Mali have had little effect; there has even been a decline in the number of state personnel, and an increase in security incidents, in these areas. The EU Stabilisation Action has also encountered challenges linked to insecurity in central Mali. Its personnel, who directly report to the EU delegation, are attached to the governors of Mopti and Segou – a set-up that resembles EU programmes in Niger, which embed technical and political advisers in ministries. Although the programme was supposed to employ ten officials and two administrators, it has deployed only four personnel at the time of writing (another two have been recruited). EU officials who have overseen the Stabilisation Action say that the programme has made some small steps forward, establishing workshops in Mopti and Segou to help plan for local implementation of the PSIRC, and improving communication between regional governors, local officials, councils, and Malian ministries with non-security portfolios. Although EU officials describe the programme as “groundbreaking” as it promotes local issues as part of a national and international agenda, there is little indication that the Stabilisation Action has had a tangible impact locally. Some observers argue that Mali lacks the administrative infrastructure needed to support the Stabilisation Action, although one former EU adviser stated more plainly that the programme “hasn’t functioned at all”. The Stabilisation Action’s attempts at innovation, particularly its focus on local concerns and governance institutions, are potentially beneficial, even if it remains poorly coordinated within the EU and seemingly unable to help the PSIRC and PARSEC make progress. But the Stabilisation Action also demonstrates the significant constraints on these programmes, and the gap between “laboratory” experiments and their real capacity to halt the deterioration of the security environment. Launched in July 2017, the Alliance for the Sahel – a French- and German-driven project that counts the EU as a key member – is a large-scale stabilisation mechanism designed to coordinate and accelerate development projects. The alliance’s members, particularly French officials, describe the organisation as the development counterpart to the G5 Sahel Joint Force, perhaps in recognition of the fact that G5 countries and their international backers had largely abandoned the grouping’s development focus in favour of security concerns. The alliance targets five key sectors: youth education, training, and employment; food security and agriculture in rural areas; climate and energy; provision of basic services; and decentralisation and governance. It has committed €6 billion to nearly 500 projects in these areas between 2018 and 2022. Despite its ambitious start, the alliance has – like the G5 Sahel Joint Force itself – produced few positive results on the ground so far. One diplomat involved in the alliance describes it as “the start of a prise de conscience” about the need to coordinate international actors and to combine security and development projects, with an eye to improving governance as well. As part of this, the alliance’s members will meet in Niamey in late September 2018 to begin new projects in what they call “fragile zones”, focusing on water-related projects. Although its representatives often speak about governance, the Alliance for the Sahel’s work appears to be largely orientated towards fairly traditional development goals rather than governance objectives in conflict zones. To help bridge this gap in conflict zones, French soldiers attached to Operation Barkhane have begun to gather information from civilians living in these areas about the projects they need. The operation’s command then passes this information to the Agence Française de Développement (AFD), which will delegate projects to local non-governmental organisations. France has begun trying this approach in the Malian border region of Ménaka, designing projects there in consultation with the region’s governor and with input from the AFD. One person on the staff of Operation Barkhane’s new commander, General Frédéric Blacho, is responsible for development. The operation worked closely with the AFD on 90 development projects in the region in 2016, as well as 24 “major” aid and development projects in Mali, Chad, and Niger in 2017. And, since 2017, a French military officer, Lieutenant-Colonel Nicolas Pierson, has been embedded in the AFD’s crisis prevention cell. Although this approach has the potential to address local needs, it could endanger non-governmental organisations if they come to be perceived as working closely with French forces. It also further blurs the line between humanitarian and counter-insurgency work. Moreover, the system is no substitute for coherent, fully integrated promotion of governance as part of a broader security strategy. The EU’s development, capacity building, and emergency response programmes in the Sahel are expanding into new territory, broadening their mandates, and deploying an increasing number of personnel. Yet these projects continue to suffer from a variety of limitations, ranging from insufficient expertise and recruitment difficulties to poor coordination, a lack of capacity to monitor and evaluate programmes, and unsuitability to a complex and increasingly unstable security environment. Such challenges reflect the gulf between the EU’s ambition of pursuing an integrated strategy and the reality of its programmes – which primarily centre on traditional development aims and responses, as well as technical and infrastructural capacity building that is often disconnected from political expertise and strategy. Although the EU has shown some encouraging flexibility in integrating its security, governance, and development goals, many of its programmes in the Sahel remain largely ineffective due to security constraints, flawed administrative structures, and poor coordination. To address these issues, the EU must further harmonise its efforts in the Sahel, better integrating political and technical advice for CSDP missions and avoiding ad hoc programmes that are disconnected from institutional strategies. This approach should involve attempts to ensure that political officers in both Brussels and EU delegations maintain regular contact with advisers to CSDP missions in the field. It should also involve the creation of incentives for mid-career officials – rather than those who are near the end of their careers or who have retired – to take up roles in CSDP missions. And the attempted innovations of the Stabilisation Action, particularly its focus on local concerns and governing institutions, should be encouraged elsewhere. Although it is important for EUCAP missions to further host governments’ security policies when they improve stability and governance, the EU should provide support to countries such as Mali and Niger in ways that push them to begin or sustain substantive SSR and peacebuilding. One way to do this is to accelerate efforts to implement key components of the Agreement for Peace and Reconciliation in Mali – which provides for, inter alia, the integration of former rebels and other militants into state security forces, as well as the creation of new military units and a territorial police force. Additionally, the EU should do more to pressure Niger and Mali to develop long-term national security strategies, using direct budgetary assistance and political support as incentives. In Mali, the EU should focus on the SSR provisions of the Algiers Accord. In Niger, it should ensure that northern Nigeriens are broadly integrated into public life and (where appropriate) the security services, as EU pressure continues to disrupt migratory and economic circuits in the country’s north. Equally, the EU should adjust its regional, national, and local strategies and programmes in the Sahel to emphasise good governance, especially the provision of justice as part of short-term stabilisation operations and long-term planning. The EU should continue trying to improve coordination between local officials and national governments, ensuring that it conditions aid and other support on measurable governance standards. Ultimately, the EU should make a greater effort to match its programmes in the Sahel with its strategic vision, identifying where it can best contribute to long-term regional stability rather than allowing short-term thinking and political priorities to dictate its work. Only then can it achieve stability in an environment where a multitude of international actors are jockeying for position and influence, pouring vast amounts of money into one of the world’s poorest regions. Andrew Lebovich is a visiting fellow with the European Council on Foreign Relations focusing on North Africa and the Sahel. He is currently a doctoral candidate in African history at Columbia University in New York, where he studies religion, politics, and society in North Africa, the Sahara, and the Sahel. The author would like to thank Compagnia di San Paolo, without whose financial support this research would not have been possible. Interview with an EU official responsible for West Africa, Brussels, June 2018; telephone interview with former EU political adviser for Mali, August 2018. Interviews with officials from the EU, France, and Germany, Bamako, January 2018; Paris and Brussels, June 2018; and New York, August 2018. Interview with an EUCAP Sahel Niger adviser, Niamey, April 2013. Interview with a senior High Authority for the Consolidation of Peace official, Niamey, Niger, January 2017. Interview with a Gao-based activist, Bamako, December 2017; telephone interview with senior French diplomat, August 2018. Interview with a prominent Agadez civil society representative, Niamey, January 2017; telephone interview with an Agadez regional official, November 2017. Interview with a French defence official, Paris, April 2018. Telephone interview with an EU SSR adviser, August 2018. Telephone interview with an EU political adviser for the Sahel, August 2018. Conversations with EU diplomats and the UN Multidimensional Integrated Stabilisation Mission in Mali’s military staff, Bamako and New York, 2017 and 2018. Telephone interview with SSR specialist, August 2018. Interviews with French defence officials, Paris, June 2018. Interview with an EU official responsible for West Africa, Brussels, 12 June 2018. Comments from UN and EU officials during meetings and presentations in Bamako, Mali, January-February 2018. Telephone interview with EU political adviser for the Sahel, August 2018. Interviews with a senior French diplomat, Paris and New York, June and August 2018. Telephone interviews with several EU political advisers, August 2018. Interview with an EU official responsible for West Africa, Brussels, June 2018; telephone interviews with an EU SSR adviser and an EU political adviser, August 2018. Interviews with EU officials, Brussels and Bamako, March and June-August 2018. Telephone interviews with senior French diplomat and EU SSR adviser, August 2018. Interviews with EU stabilisation and conflict-prevention specialists, Brussels and Paris, September 2017, May 2018, and June 2018. EEAS, “The EU Integrated Approach in the Sahel”, 8 February 2018. EEAS, “The EU Integrated Approach in the Sahel”. Interview with EU stabilisation officials, Brussels, 13 June 2018. Conversation with a human rights researcher focused on central Mali, Bamako, February 2018. Telephone interview with a former EU SSR adviser, August 2018. Interviews with AFD Africa and stabilisation staff, Paris, January 2018. Telephone interview with a senior French diplomat, August 2018. Personal communications with AFD stabilisation and crisis response official, September 2018.